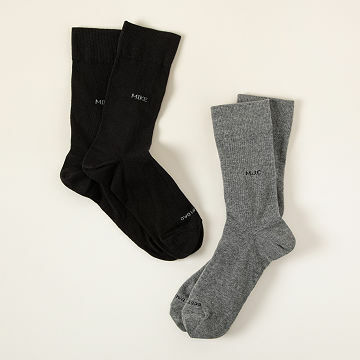 These Pima™ cotton socks are custom knit with any phrase of your choosing for comfort that's personal. Getting comfy isn't one-size fits all. You've got a favorite for everything, from sleeping positions to fleece jackets. Now, with this 5 pair set of Pima™ cotton socks, you'll take personal comfort to another level with a knitted phrase of your choosing. Stick to a classic monogram with initials at the ankle and full name across the toes, wish someone a Happy Birthday, or remind pop of his #1 Dad status. The possibilities are endless—as long as they fit within eight characters at the ankle and twenty characters across the toes. Made to order in Phnom Penh, Cambodia. Click here to see personalization area and character limits. Looking for more ways to keep your toes looking cool? Check out our socks-focused gift guide on the blog. Machine wash safe between 30c or 65f. Low heat dryer only, to prevent shrinking. This is a made-to-order item. If you order today your item will ship no later than 05/03/2019. My feet that's where it all starts. Unhappy feet spoiles the whole body. This was a perfect gift! A perfect gift for the man who has everything! Love the idea of the product. These would be okay for someone that lives in a black suit. But today's world Is a bit more colorful. If you provide a set with various colors, I will buy them again. My husband gets to be insipired each day as he puts his shoes on! I thought this was a great idea for anyone that has everything already. Great for a gift. Excellent product. I also bought them also for both my daughters because we steal my husbands socks. Glad I bought these socks! My son in law absolutely loved these socks when he opened them at Christmas. He went on to comment how he sees a lot of monogramming in his office. In particular, his full name across the toe was unique and a great conversation piece. My son was surprised and pleased!